In my last post, I left you with a question: "Would you take a drug that would help you forget a traumatic event?" My answer to that question is "no". The traumatic events in my life have been defining moments and have provided me with opportunities to stretch and grow. Yes, they were painful, but not one person makes it through life without some pain. In the book The Prophet, Kahlil Gibran writes: "Your pain is the breaking of the shell that encloses your understanding. Even as the stone of the fruit must break that its heart may stand in the sun, so must you know pain. And you would accept the seasons of your heart, even as you have always accepted the seasons that pass over your fields. And you would watch with serenity through the winters of your grief." The Greeks had a belief that souls on their way to Hades had to cross the River of Lethe (Lethe means forgetfulness) to prepare for the next incarnation. Drinking from this river would cause the souls to lose all memory of their past as well as their knowledge and wisdom. Cults developed that taught members to ignore their great thirst when crossing the Lethe and to continue on to the River of Mnemosyne (meaning memory). By drinking from this river they would remember everything that had ever happened to them, and in doing so, they would again feel the pain and the sorrow, as well as the joy. But these souls would also retain the wisdom and the knowledge that they had gained as a result of these painful events. To me, the other benefit of living through and remembering the difficult times of our lives, is the depth of compassion that comes as a result of our experience. Our hearts are like wells of compassion that fill to the point of over-flowing, and we can truly empathize with the experience of others. No matter what traumatic experience you may have experienced in your life in the past, or that you may be going through at this very moment, know that you are deepening and expanding in wisdom and compassion. The stone or seed of the fruit of your understanding is preparing to burst forth into new awareness. And lastly, remember that you are never alone as you face these times of trial and tribulation. The one presence and the one power, God, is with you--is within you--as your strength, comfort and peace. Would you take a drug that would help you forget a traumatic event? A woman in Texas was trying to escape a flash flood with her baby. Suddenly, her baby was torn from her arms and carried away in the swirling waters. This memory is now etched in her mind. Not long ago, a drug was found that would destroy traumatic memories, if taken within a short period of time after the event. If you had the opportunity to take a drug to help you forget a traumatic event in your life, would you take it? Why or why not? Your comments are invited. Are you looking for some inspiration today? If the answer is "yes" then check out a short video about a college student named Patrick Henry Hughes. This young man was born blind with physical deformities that kept him from being able to walk. And yet, these physical challenges didn't keep Patrick from accomplishing incredible things. His spiritual gifts, courage and faith more than compensate for his physical challenges. My husband came home yesterday talking about a t-shirt he saw with an unusual message. It was worn by a hefty, slightly disheveled young man of around 19 or 20. He sat down at a table in a cafeteria with his back to my husband. His t-shirt said, "It's better to be hated for being who you are than to be loved for being who you're not." I'd never seen that message on a t-shirt before and it struck me as pretty profound. As children, many of us find ourselves being the person that we think we need to be in order to fit in. Sometimes we don't outgrow that behavior. I grew up a "people pleaser," wanting to be liked. For years I molded myself to play whatever part people wanted me to play in their life. This was especially true with men. In my first marriage, I tried to be the obedient wife who stayed home, cooked and cleaned. My first husband loved having me waiting for him at home with dinner on the table. It reminded him of his own mother, I think. There was only so much cleaning I could do, so I began to watch "General Hospital" and sing along with Carole King on the stereo. Depressed and ten pounds heavier than before I'd gotten married, I couldn't stand to look at myself in the mirror. I couldn't remember who I was anymore. One day I stood my ground with my husband and told him that I was getting a job. I saw an ad in the paper for Gloria Marshall Figure Salon. They were looking for a counselor. I applied and got the job. My husband was not happy with me, but I was finally feeling good about myself. Each day, I came home with a feeling of satisfaction and, even though my paycheck was small, it added to my sense of accomplishment. My first marriage barely lasted a year. There were times that I felt guilty about going against my husband's wishes and getting a job. But I had to be true to who I was and not settle for my first husband's idea of what a wife should be. In Marianne Williamson's book, A Return to Love, she wrote that people had often asked her about surrendering their lives to God, asking such things as, "I'm a musician--what if He wants me to be an accountant?" Marianne's response was, "Why would He? Wouldn't He rather have someone who understands numbers do that job?" Each of us is born with special gifts, passions and talents. These are a compass to us as we head out into the world. We're always going to get messages from the outside world about how we should look, dress, what career we should pursue. But listening to our heart and being our authentic self will bring us true happiness in the long run. And as for me...I'm now happily married to a man who loves me for the person that I am. There are no hoops to jump through or parts to play. I am me, imperfections and all, and that's okay with him. Unity "World Day of Prayer"
On Thursday, September 13, Unity will hold its 14th annual World Day of Prayer. This year the focus is on peace. We have been assured that "wherever two or more are gathered" that Christ is in the midst of them. Can you imagine how powerful that Christ presence can be when there are millions of people joining together throughout the day to pray for peace, love and harmony in the world? I invite you to set aside time during the day on the 13th to pray--whether it's for a few minutes or for an hour. It doesn't matter where you are, at work or at home; you can close your eyes for a few moments of prayer. No matter what your faith may be, whether it's Christian, Muslim, Judaism, Buddhism, Hinduism or whatever--pray or meditate according to your tradition. Here is a link to the web site for Unity's World Day of Prayer: http://www.worlddayofprayer.org/ On the web site you will find: a place to list the people that you would like put on a prayer list; a schedule of events being held at Unity Village in Missouri during the day on September 13; Unity churches around the world that will be holding special events for World Day of Prayer; live streaming video of the events of the day as they unfold. You can call Unity Village directly for more information at 816-524-3550. We are peacemakers, one in the love of God. With hearts united,we establish harmony and peace in our lives and in the world. I've always believed that if people of different religions sat down with one another and talked, we would have far less wars and more friendships. Maybe that's why I enjoyed the book, The Faith Club. After the events of September 11, 2001, three mothers from New York City, all of different faiths, came together with the intention of learning more about each other's religions. And, in the process, they came to learn more about their own. Ranya, an American Muslim of Palestinian descent started the group after her children began to ask questions about Islam, God and death. In a city that had become increasingly suspicious of Muslims, Ranya, found herself fearful and on the defensive. She was ashamed of the acts of Muslim extremists who used the religion she loved to justify acts of terrorism. Suzanne, whose childhood grew up as a Catholic, had later found herself more in alignment with the Episcopal Church. As a Christian, she thought that her beliefs and faith were strong. After joining the Faith Club, she began to question the creeds and dogma of her faith and to see that things were not as clear-cut and black and white as she had once thought. Priscilla, who was Jewish, struggled with her faith, finding that she was sympathic to the plight of the Palestinian refugees in Israel. Fearing that she was the only Jew who felt this way, she hesitated in sharing her feelings with other Jews. 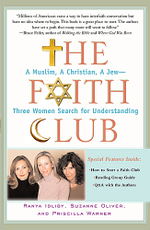 As readers, we are able to eavesdrop on the conversations of these three women as they wrestle with matters of faith, anti-Semitism, prejudice and stereotypes. The questions they ask and the honesty with which they respond is touching. I wonder how many people would be willing to turn their religious beliefs wrong-side-out and look at them from a different perspective. Over three years, these young mothers not only come to see the beauty and truth in each other's religions but they also pass this respect and appreciation on to their children. A deep friendship grows between them as they support each other through times of personal loss and grief. And if you'd like to purchase the book, The Faith Club, you can use the link in my "Recommended Books" section which will take you directly to Amazon.com. What kind of work do you do? Do you see it as important or just something you do to make a living? What we do in our job is not as important as how we do it--the consciousness we bring to our daily work and the love. Here is a prayer that was written by Rev. Dorothy Piersin. It is a good way to begin our day at work. God, bless me in my work this day. May love direct and guide each hand. May kindness prompt the words I say, and thoughts be swift at Your command. Each task is but a shining goal. 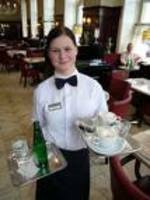 In its attainment I shall strive to serve You well with heart and soul, with eager mind, alert, alive. Be with me as I work this day and help me know that we are one, so I may hear You softly say, "Well done, my good and faithful son!"